Folk music remains at the core of this 2017 project by one of Norway's finest traditional and modern vocalist, this time combining the Japanese gagaku tradition that brings together contemporary and traditional music from Japan and Norway. Musicians on this recording are Hakon Thelin on acoustic bass, Remi Miura on the sho, and Kaizan Harago on shakuhachi. 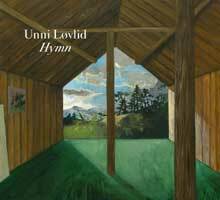 "Jeg lagde meg så silde (Late one night I lay asleep)"
"Jeg går i tusind tanker (I wander in a thousand thoughts)"
Unni Løvlid releases her fifth recording, Hymn. Unni Løvlid’s tireless musical quest brings her this time to Japan. Together with fellow musicians Håkon Thelin, Remi Miura and Kaizan Harago she has taken a step further from LUX, her 2013 release that garnered outstanding reviews. Folk music is still at the core of Unni’s project, this time combining the Japanese gagaku tradition and the distinctive musical personality of the individual performers, bringing together contemporary and traditional music from Japan and Norway. The musicians have taken existing compositions such as Lars Petter Hagen’s “Hymn”, overlaying it with the folk melody “Kvilesteinen”. Texts by Jon Fosse and Olav H Hauge are set to old tunes; the musicians have collectively created new music, new forms of expression. Hikari furu Oto, a piece by the renowned gagaku composer Hideki togi has been fused with words by Olina Nygård from Honindal and a folk tune from Sykkylven. Unni has worked on this project since 2014, finding inspiration in Norwegian exponents of japonism such as Frida Hansen and Nikolai Astrup. Unni draws on familiar, traditional folk songs including “Den svalande vind”, “Jeg lagde meg så silde” and “Jeg går i tusind tanker”, playing with our perception of how familiar things changes according to context. All contents of these web pages ©2001-2016 FNI Multimedia / cdRoots unless otherwise stated.